With three layovers and a total of about thirty hours of travel, you could say we were relieved and excited to finally arrive in Siem Reap, Cambodia. My best friend, girlfriend and I had been planning our trip for months and finally, we made it. Without a plan for a place to stay, we grabbed a tuk tuk from the airport and heading into town. Exploring the town brought back memories for me because I had been there five years ago with my family. And seeing a place that I once explored as a child, with the perspective I now have as a young adult was intriguing. This being my first real trip as an adult in another country, everything felt more real. Adventuring with our own budget and our own rules was something new to all of us and it felt great. 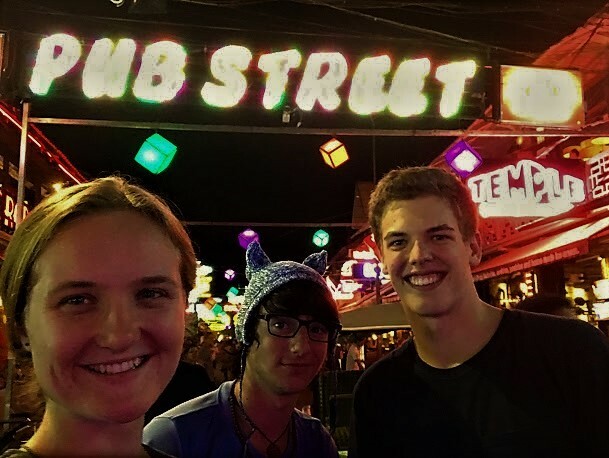 As we searched around for a cheap hostel I noticed so much more life in the booming traveler’s hub. Finding a place to stay was painless, the town is full of hostels which are great for meeting people and having a super cheap place to stay, if you’re willing to share a room of course. It’s understandable that it isn’t for everyone, but it’s perfectly suitable for three teenagers. After about a week or so we wanted to have a little get away from the hustle and bustle of the hostel life. So, we started looking around for something a little nicer for a night or two. After doing some research we didn’t seem to find anything that caught our eyes until we were invited to stay at the Tresur d’Angkor Suite. We couldn’t pass up the surprisingly affordable resort. We booked a two-night stay and packed our bags! 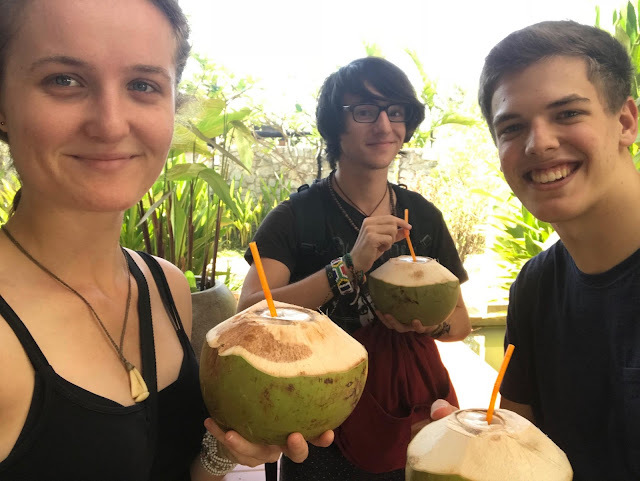 When we arrived at the hotel we were greeted by a wonderful staff and some refreshments in the form of fresh cut coconuts. Every member of staff we interacted with were all very friendly and helpful with anything we needed. I could not be more pleased by their wonderful service. We decided to have our days of exploring Angkor Wat and other surrounding temples to be the same days we were staying at Tresur d’Angkor. I cannot stress enough how great it was to come back to this relaxing haven and lounge by the pool after a full day of walking around in the Cambodian heat. The rooms also had powerful air conditioning allowing for a nice escape from the heat. And if you’re looking for comfort you won’t be disappointed with some of the most comfortable beds we slept in on our trip. We were treated to a four course meal at the their restaurant that was fantastic! Once again the service was splendid and the food was mouthwatering. Hats off too the chef and the rest of the kitchen crew. The resort is somewhat of a hidden gem. It’s just far enough away to be difficult to find or maybe seems too far away from all the action. But being just a short 5-minute tuk tuk ride from the center of town, it makes for a great getaway. And grabbing a tuk tuk from the hotel is as simple as asking at the front desk. The real beauty of being located outside of town is the amount of space they have. Instead of being crammed into a little lot, they had a charmingly landscaped wide-open space. With nine whitewashed villas and a total of eighteen rooms surrounding a huge freshwater pool, it really is a hidden paradise. The traditional Khmer style and more modern elements blend amazingly in the architecture and interior design of all the villas. All and all, we were thrilled with our stay here and how affordable it is to have such a luxurious experience. I would highly recommend it to anyone looking for some of the more modern comforts while off on an adventure.